My Favorite Things' Camp Create goes on! The craft activity for Day 4 is "Monochromatic Magic." I used MFT's "Sophisticated Snowflake" (apparently discontinued) & "Joyous Christmas Sentiments" (also apparently discontinued) for my simple, monochromatic holiday card. I cut a piece of 140 lb. watercolor paper to 4.5x6". I wanted it a little larger than an A2 card size, so I could mask off the edges. I masked off 1/4" on each side with painter's tape, and stamped the snowflakes with Versamark ink. 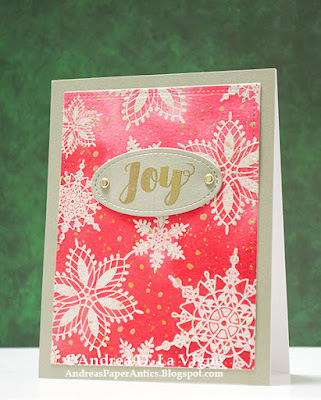 After I stamped each snowflake, I sprinkled on Ranger Silver Pearl embossing powder, so I could see where I had stamped. Finally, when I had finished stamping, I melted the powder with my heat gun, and removed the powder-coated pieces of tape. I then taped my panel to a wooden cutting board with yellow Frog tape, both to mask the edges again and so it would stay flat. Then I blended Abandoned Coral, Candied Apple, Festive Berries, & Fired Brick Distress inks to create an ombre look on my panel. After I had the inks down, I spritzed the paper generously with my homemade Perfect Pearls mist, and tilted the board around to get the color to move somewhat. I dried it with my heat gun, and buffed off the extra ink from the embossed snowflakes. Then I added flicks of gold (which I used as a neutral) with Champagne Gold & Yellow Gold Gansai Tambi Starry Colors watercolors over my panel. When I went to trim down my panel, I realized that my measurements had been slightly off when I cut and masked it. So, I decided instead of leaving the masked white border, I'd just die cut the piece down with a Lawn Fawn "Small Stitched Rectangle" die. I cut am A2 size mat from pearlized cardstock by The Paper Studio. I die cut an oval from that panel with a "Large Stitched Oval" die from Lawn Fawn. I stamped my greeting on that with Versamark, and heat embossed with Ranger Super Fine Detail Gold embossing powder. I attached that to my inked panel with a bit of foam tape in the middle of the oval, and brads at the ends. Finally, I adhered my focal panel to the mat, covering up the oval hole, and mounted my card front to a white A2 card base. Christmas Card Throwdown: "Embossed Impressions"
Simon Says Stamp's Wednesday Challenge: "Add a Sentiment"
I find getting the measurements right is one of the hardest things! Your beautiful panel looks just right as it is and the colour is wonderful. You've used the emboss resist technique beautifully. And it must have been serendipity because the stitched detail looks wonderful. Thank you for joining us at the Christmas Card Throwdown challenge. This is such a lovely design. I adore how you have you embossed those snowflakes. Thank you for playing along at Christmas Card Throwdown.